A Philadelphia Inquirer story takes issue with new guidelines on osteoporosis screening from the U.S. Preventive Services Task Force (USPSTF). That’s quite an accusation. But does it hold up to scrutiny? The USPSTF concludes that the current evidence is insufficient to assess the balance of benefits and harms of screening for osteoporosis to prevent osteoporotic fractures in men. (I statement). 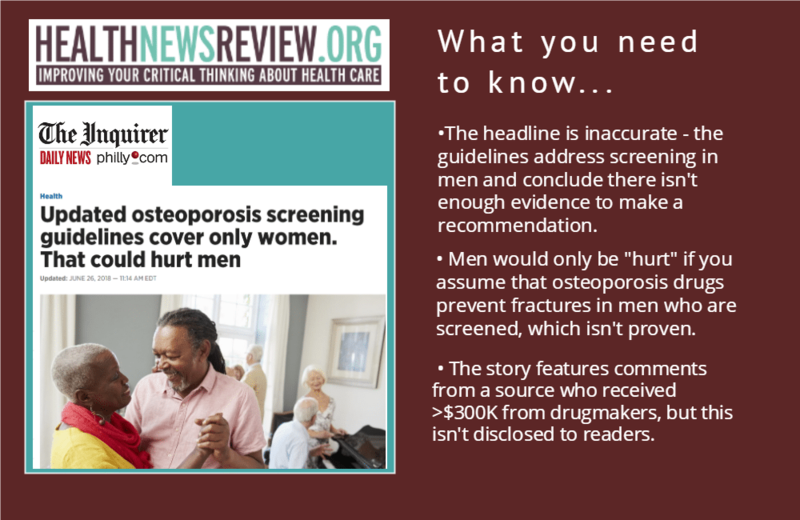 So it’s inaccurate to state that men aren’t “covered” by the new guidelines, and doubly so to imply that a lack of coverage promotes sexist notions about osteoporosis. Alex Krist, MD, vice chair of the USPSTF and professor of family medicine at Virginia Commonwealth University, says journalists and the public often misinterpret the “insufficient evidence” rating to be a recommendation against intervention — as seems to have happened here. What about the Inquirer’s claim that men could be “hurt” by the new recommendation? This view assumes that there’s an established benefit from finding and treating osteoporosis in men with bone-strengthening drugs — and that failing to endorse screening is somehow taking this benefit away from men and leading to harm. Although some treatments have been found to be effective in preventing fractures in postmenopausal women with osteoporosis, it cannot be assumed that they will be equally effective in men because the underlying biology of bones may differ in men due to differences in testosterone and estrogen levels. The task force’s cogent explanation didn’t make it into the Inquirer’s imbalanced and incomplete piece. But the story did give a platform to industry-affiliated voices who advocate bone density testing for all men over the age of 70. That’s the same kind of logic that led to widespread adoption of hormone replacement therapy in postmenopausal women, a practice later shown in randomized controlled trials to increase the risk of stroke and breast cancer. Krist also defended the need for evidence proving the benefits of treating patients based on screening. The Inquirer isn’t alone in its promotion of this industry-friendly narrative. The New York Times has raised an alarm on multiple occasions about declining rates of osteoporosis screening in women and decreasing use of osteoporosis drugs. Those stories are stacked with sources who have undisclosed ties to drugmakers and who are affiliated with organizations that receive pharmaceutical funding. They make much of the drugs’ benefits, downplay serious harms, and blame media coverage of adverse effects for scaring people away from these drugs. Importantly, they lack perspective from independent experts who’ve raised questions about the value of expanded screening and who really benefits from it. 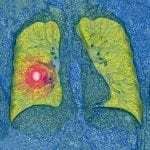 Even the World Health Organization has distanced itself from deceptive practices, advanced by industry-affiliated researchers, that are likely to increase the population eligible for screening and result in increased use of osteoporosis drugs. This context calls for scrutiny of the voices calling for more medicine and better understanding of the USPSTF’s role in serving the public. More importantly, you do not address USPTFs recs for women. The group examines the evidence and harms and benefits: grade B. They are clear in their statement. Yet, below and other past HNR posts cast skeptical light on available data. Did USPTF get it wrong? The contrary positions need reconciling.